The name “Keys to Travel” was chosen because it has several meanings to the founders, Nikki Kreps and Wendy Peterson Kreps. First, when Keith, Wendy, and daughter Nikki Kreps were in Munich, Germany together staying at the Sofitel, they pulled up in their luggage packed SUV to check in. As the bellboys were unloading the car and Keith was getting the car valeted, the valet asked Keith for his name. He told them it was Keith and the valet replied with, “Oh, Keys. Like keys to a car?” And from then on it was an ongoing joke to refer to Keith as Keys. Additionally, Keys to Travel means to Nikki and Wendy that a big KEY contributor to travel is being able to afford it. So this scholarship program will give students the financial key to be able to travel. Lastly, the “keys” aspect of the name relate to Keith, Wendy, and Nikki’s business, Pro-Techs Dealer Services, LLC, and Keith being a part of the auto industry for most of his life. Keith, Wendy, and Nikki’s motivation behind Keys to Travel was first and foremost Keith’s love for travel and how important he felt it was for everyone and anyone to experience the rest of the world. He also was very passionate about helping Nikki, his daughter, see the world and helping Nikki expand even further with the funding of her study abroad program. In more recent months, Raven and Allie, two UW Madison nursing students who helped care for Keith in his home while he was sick, had the opportunity to study abroad for nursing. 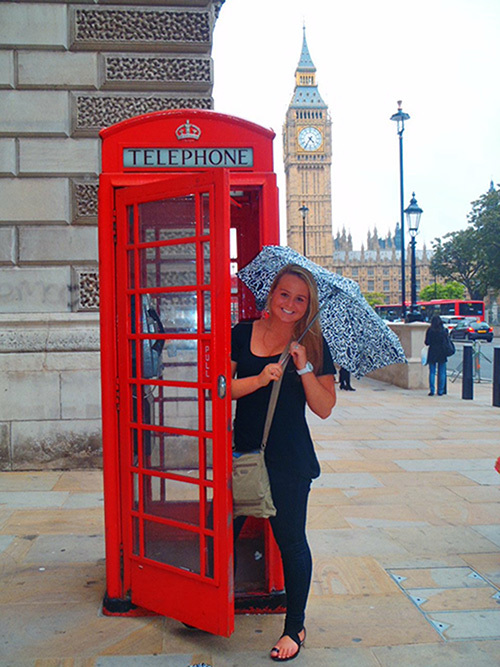 In the summer of 2014, Raven, who had been helping care for Keith for 3 years, was able to participate in a nursing study abroad program in Dublin, Ireland. Keith was telling Raven about all of these other places she should go to in Europe while she was there. Unfortunately, Raven did not have the additional funds to travel to other places on the weekends. But, Keith loved Raven so much and wanted her to have those experiences so badly that he ended up giving her the extra means to be able to go on those extra trips so that she could experience Paris and London. Allie came into the Kreps’ lives to help take care of Keith while Raven was on that study abroad trip. They immediately loved Allie and as the weeks went on, Allie actually ended up telling them that she too wanted to go on that same trip as Raven but couldn’t afford it so she ended up doing a program up in northern Wisconsin. Keith was upset that Allie wasn’t able to go and wished he would have known her earlier so that he could have also helped Allie study abroad like he helped Raven and Nikki. This is why Keys to Travel was founded, to help students study abroad and experience the world. This program is only offered to business students, in honor of Keith and Nikki, and nursing students, in honor of Raven and Allie, at the University of Wisconsin Madison. Keys to Travel, A Keith J Kreps Foundation Inc., was founded in Madison, Wisconsin on August 15, 2014. Keith Kreps was very instrumental before his passing on whom he wanted selected as Keys to Travel’s board members. Nikki Kreps and Wendy Peterson Kreps co-founded Keys to Travel, A Keith J Kreps Foundation, Inc., and our board members consist of Ellen Johnson, Dave Gorwitz, Neleta Schene, and Julie Feller. Keys to Travel is a legal, non-profit corporation with 501(c)(3) status so that all of our very generous donations are completely tax deductible and greatly appreciated.